One of the most beloved members of the New York ADR community, Hon. Michael J. Dontzin (Ret. ), passed away on June 22, 2012. Judge Dontzin was one of the first New York-based judicial panelists and a founding member of the JAMS New York Resolution Center. During his 20 years with JAMS, he resolved thousands of personal injury, employment, commercial and other types of cases as a mediator, arbitrator, mini-trial neutral and special master. Judge Dontzin truly enjoyed working with lawyers and their clients and derived great satisfaction in helping them resolve their cases. While a mediator at JAMS, Judge Dontzin also practiced law with his son Matthew S. Dontzin at The Dontzin Law Firm, which they co-founded in 1993. 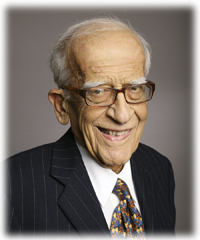 Judge Dontzin was also a pillar of the New York legal and ADR communities. He frequently lectured on ADR to the litigation sections of law firms and to many other groups, including the New York State Trial Lawyers Association and other bar association committees and gatherings. In addition to many other philanthropic commitments, he was a principal benefactor of the JAMS Foundation. Judge Dontzin had varied and successful career before joining JAMS, contributing greatly to the courts and to the City of New York as a whole. He practiced law until 1966 when he was appointed as Counsel to Mayor John Lindsay, where he led the Mayor’s Screening Committee on the Judiciary and also served as the Mayor’s liaison to the court system and to the Police Department. Appointed by Mayor Lindsay as Judge of the Criminal Court in 1972, he was elected as a Justice of the Supreme Court, New York County in 1976 and was re-elected to successive terms until his retirement from the bench in 1992. He is survived by his wife, two children, daughter-in-law and two grandchildren. When not practicing law, Judge Dontzin’s other great passion was to serve as his wife’s “Stage Door Johnny,” accompanying her to each of her theater performances. Everyone at JAMS, as well as Judge Dontzin's many admirers in both the ADR and legal communities, will greatly miss him. Judge Dontzin’s family will receive guests at his son Matthew’s house, 6 East 81st Street, New York City, on June 25 and June 26, from 6 to 9 p.m. A larger memorial service will be planned for September. In lieu of flowers, donations should be made to the National Multiple Sclerosis Society.